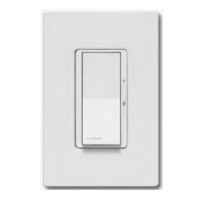 This Lutron companion ceiling paddle fan control is designed to be installed in conjunction with the Maestro Fan Control, allowing one ceiling paddle fan to be controlled from multiple locations. The color is white. In multi-fan applications, you will need to purchase the Lutron Canopy Module. To control the paddle fan(s) from multiple locations, purchase one Ceiling Paddle Fan Control, and a companion switch for each additional location. Note: A wallplate is not included, so must be purchased seperately.